Friday night had come and I am starting to get into a bad habit. No, it’s not running around the town to the wee hours. I’ve had my fill of that. What I haven’t had my fill of is the the taste and aroma of freshly baked bread. I actually look forward to doing it weekends. 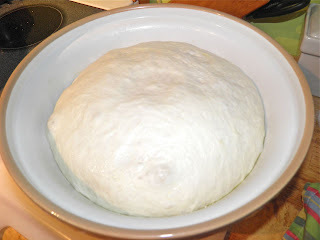 Bowl full 'o bread dough. After first rise. 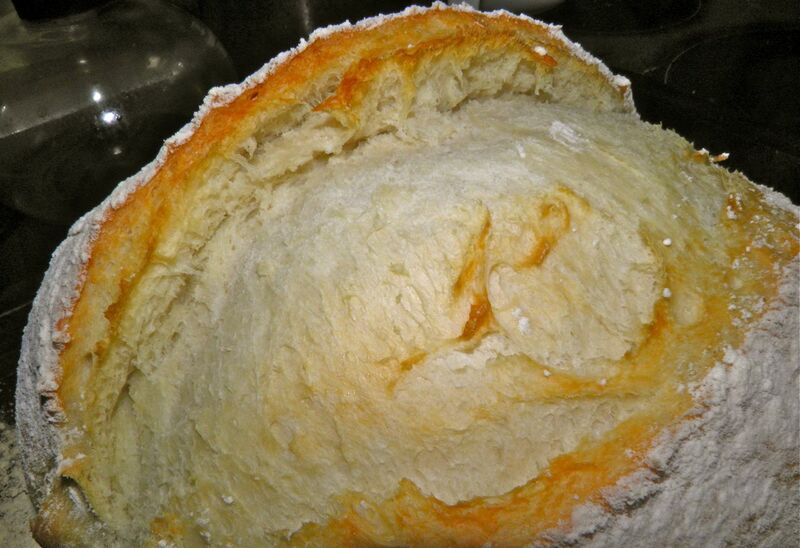 So my new “bad habit” most Friday nights is to put together a sponge (or sourdough starter) for bread in the morning. I have learned over the years it is far better to wake up with the anticipation of the smell of fresh baked bread than the odour of cigarettes and 3 AM donairs on your clothes. Yeah, I’m getting old (I mean “maturing…finally). At least baking bread is more rewarding than looking in your wallet to see how much money you still have left for things like…bread. 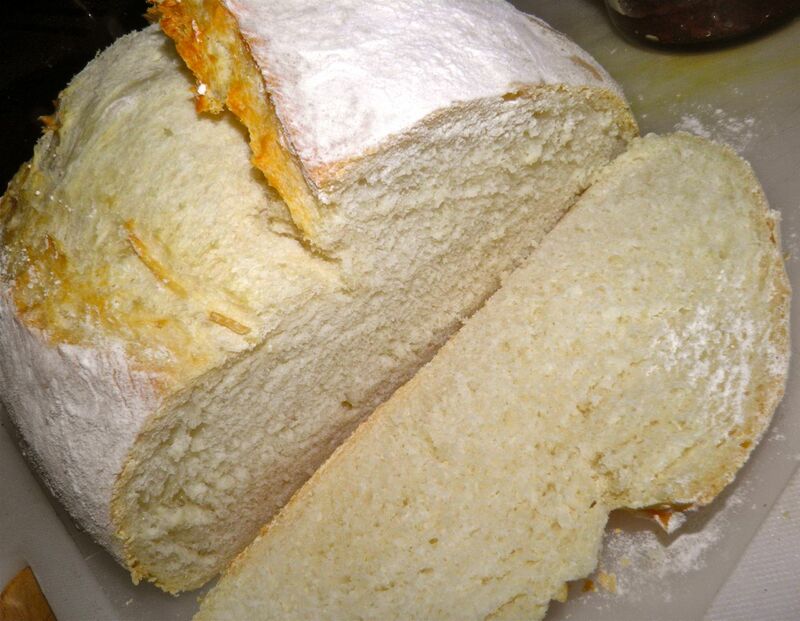 Baking bread is a family ritual that conjures as well as creates memories. Whenever I make bread my mother retells her bread memory of when she was young. It was her job to set the bread to raising before she went to school. She just didn’t make one loaf either. It was for the week and there were six hungry mouths. This was in the mid-1930s. You had to make bread then, or go without. I think of her whenever I put water to yeast. It’s my connection to the past of my own family. I guess I derive dual pleasure from baking: the pride of a good result, and the warmth of connection to those I love and have loved. Shaped for second rise. That's a 12x18 pan. You can make bread in a far more compressed timeframe than this recipe. But I love sourdough for two different reasons. The first is the starter helps extend the freshness of the bread. The second is the slightly sour heady taste that is so lacking in the “white bread” we purchase commercially. I have to admit my bread was a little more “even” inside than I expected, but I chalk that up to not kneading as long as I should have. It was 6am when I was doing it, and I think I was more interested in my coffee than my bread. There’s nothing like bread you’ve made yourself. There’s no reason why anyone can’t do this. All you need is the time and patience to wait for the yeast to do its thing. I have used this loaf sliced with butter, with dinner to sop up soup juices, in grilled cheddar cheese sandwiches and most recently in croque-monsieur (a French ham and Emmental grilled cheese sandwich. If you’ve never used homemade sourdough bread for grilled cheese sandwiches you have no idea what you’re missing. Make this bread, and then make yourself a sandwich! After second rise it grew considerably. Note the slit. Place the levain ingredients in a medium sized bowl and mix well. You’ll have a semi-wet mess. Cover tightly with plastic wrap and place a tea towel on top. Let the levain rise in a warm spot for at least 8 hours. 12 hours is even better. The result will be a bubbly, loose mass of slightly sour smelling goodness. In a large bowl combine the water and yeast. Let bloom for 10 minutes. If the yeast hasn’t activated start again with new yeast. Mix the levain into the water. Then add the salt and sugar and mix. Add the remaining flour and stir. Once the flour is almost completely incorporated switch to your hands and knead until the dough comes together. Knead the dough until it is just barely sticky, about 5-10 minutes. The dough will feel very damp. Lightly oil the bowl and place the dough back in. Turn to coat with oil. Cover with plastic wrap and a towel and let rise in a warm spot until doubled, or more, in bulk. This will take about 2 to 2-1/2 hours. 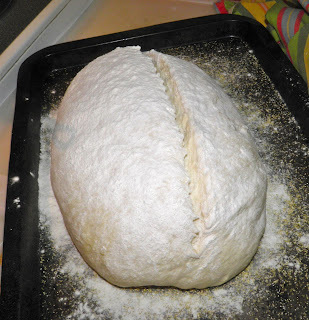 After first rise, punch the dough down, knead briefly and shape into either one large oblong, or two oblong loaves. Place on a baking sheet that has been dusted with cornmeal or flour. Let rise again until doubled, a further 2 hours. 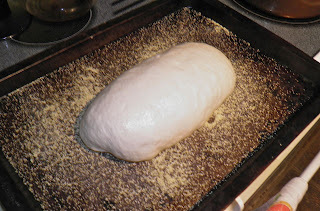 Preheat the oven to 350°F about 20 minutes before the bread has completed its second rise. Throw 1/2 cup water onto the floor of the oven 2-3 minutes before you’re ready to bake; quickly close the door to trap the moisture. Dust the top of the bread with flour. Slice lengthwise down the top at a very sharp 45° angle with a razor blade. This cut makes the characteristic “blown apart flap” of beautiful artesian bread. Place the loaf/loaves in the oven and bake for 40-45 minutes for 1 large loaf; 30-40 minutes for two smaller loaves. * Substitute 1 cup of the white flour for whole wheat if you wish.